James Blair Glennon Jr., 90, a retired Marine Colonel, insurance underwriter and stockbroker, died of congestive heart failure March 22, 2008, at Virginia Hospital Center in Arlington. He lived in Arlington County for the past 46 years. Colonel Glennon co-owned and operated the brokerage firm Smith & Lawrence in Arlington until 2006. He previously worked as a stockbroker with the Johnson & Lemon and from 1965 to 1980 was a certified life underwriter for Acacia Mutual Life Insurance. He was a native Washingtonian, the son of a naval officer and maternal grandson of Marine Lieutenant General John Archer Lejeune, for whom the Marines' Camp Lejeune in North Carolina is named. His paternal grandfather, James Henry Glennon, was a Rear Admiral in the Navy who had two ships named in his honor. The younger Glennon graduated from Columbian Prep in the District before entering the U.S. Naval Academy. He graduated in 1939, joined the Marines and arrived at Pearl Harbor a week before the Japanese attacked. He spent the rest of World War II in the Aleutians and the Pacific until he was wounded in 1945 when a Japanese kamikaze hit the bridge of the battleship New Mexico. He remained in the Marines, with postings in Okinawa, Lebanon and the Pentagon, until he retired in 1965. Among Colonel Glennon's military awards were two awards of the Bronze Star and a Purple Heart. He was a member of the Retired Officers Association, the Naval Academy Alumni Association and the Military Order of the Carabao. A son, John Lejeune Glennon, died in 2006. Survivors include his wife of 62 years, Margaret Wyatte Glennon of Arlington; three children, James Glennon of Great Falls, Mary Vincent of Potomac and Laura Woodruff of San Diego; nine grandchildren; and two great-grandchildren. 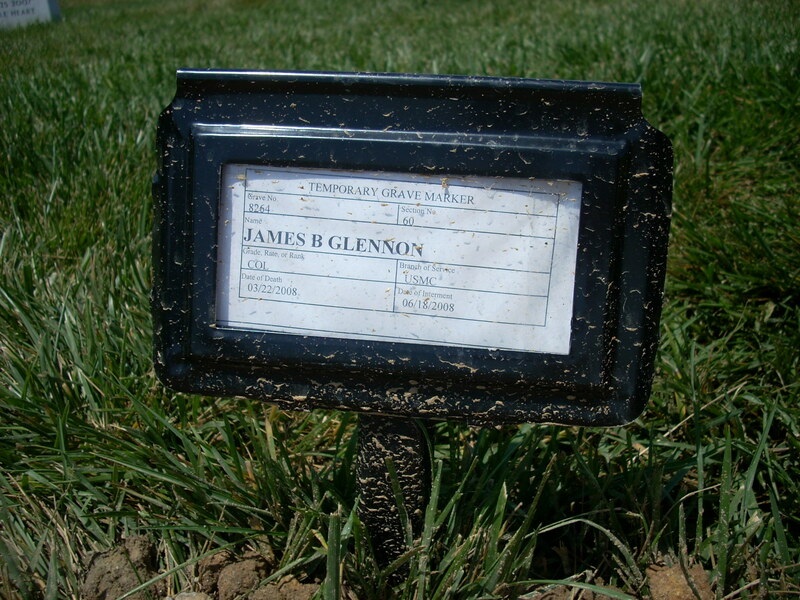 NOTE: Colonel Glennon was buried with full military honors in Section 60, Grave 8264, Arlington National Cemetery, on 18 June 2008.